Jess Chambers, creator of Little Bunny greeting cards, is a slightly obsessive natural redhead who loves animals. 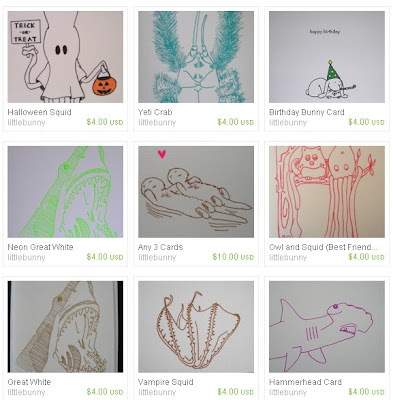 Looking at her edgily whimsical, hand drawn gocco prints of yeti crabs, vampire squid, and drifting otters, one gets the sense that a little obsession is a good thing. Jess started making cards about three years ago as an extension of her own appreciation for snail mail in a world dominated by email exchanges. She finds getting something in the mail so exciting and heartwarming, Jess likes the thought of her cards giving someone those same feelings. A very early animal-talker (she used to have extensive conversations with her stuffed animals), Jess has given shelter over the years to Fluffy, a lop-eared rabbit; Catherine, a hamster; Sophie aka Mees, a pug that still lives at her parents' house; and Sergio, a sweet mutt who adopted her two years ago. You can see that she gives a lot of thought to the inner life of animals with the sometimes startlingly imaginative characters that populate her cards. Who says a squid and an owl can't be best friends? 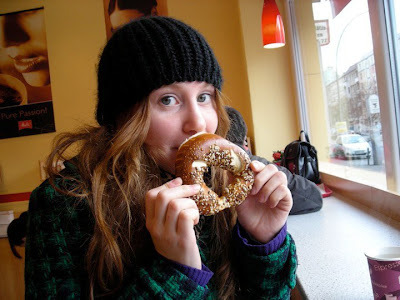 Jess defines her interests as passionate opportunities to really get into objects and ideas she finds compelling. You can engage all of Jess' interests, and see if they match your own, at the upcoming Crafts in Chelsea market on Saturday, October 16, 2010. Buying a plane ticket and planning a trip. Looking back and having regrets about not doing something that I really wanted to. I think that I identify more with specific historical periods than historical people. I've always been into ancient Egypt, the Titanic, and Paris in the early 1900's. Maybe those are the places that I've lived(and died) in past lives? Martha Stewart is my hero, she can help you bake, clean, wrap presents, and fix up your garden. That woman is amazing. Kanske Ar Jag Kar I Dig by Jens Lekman. If you could have only one creative tool on a deserted island, what would it be? Scissors. They could function for art and for survival. I'm willing to take chances, and just go for it. Food definitely. I'm addicted to food magazines, cooking/baking, buying kitchen gadgets, and finding new eateries to indulge in. I'm pretty happy right now, and life continues to get better. But when I look back, my favorite time was being 12. Everything was so simple! Going to dance competitions, hanging out with friends, not really having a care in the world, and of course having summers off. It's between graduating from college (I went to 4 colleges in 6 years), adopting my dog Sergio, and creating an etsy shop and working towards creating a small business. I'd hope to be a giant squid, but I'd also be OK coming back as a professional ballerina. Two different side of the spectrum, I know. Fluffy J Bunny, a stuffed rabbit that I've had for years. He looks like the rabbit that I had, also named Fluffy. Also the inspiration for my shop mascot. I wish that my sewing skills were better. This is where the patience issue comes in, if I had more patience I might be more skilled at sewing. Bugs (ladybugs and butterflies excluded). William Kentridge, Hannah Hoch, Lucien Freud, Lauren Dittmer, and Carly Valentine. Glittery pumpkins on construction paper. My mom and grandmoms were always doing crafty projects with me when I was little. Little Bunny cards may be found at Stray Vintage in Sunnyside, Queens, New York, 323 Gallery In Royal Oak, Michigan, and at the indoor Fall/winter Brooklyn Flea. Don't forget to check out www.etsy.com/shop/littlebunny for regular updates about where to find Jess in person, as well as her blog, Captain's Log.